The gunners come off an impressive victory last weekend in which the score blew out to a massive 7-1 victory. A hat-trick to talisman Robin van Persie, a brace to youngster Alex Oxlade-Chamberlain and solitary goals to Arteta and Henry sealed a memborable win and will surely provide a solid platform for this upcoming match. Looking at defence, it is a the first time in a long time that Wenger has a first-team back-line to choose from with injury prone youngster Kieran Gibbs returning to the squad after returning from a hernia problem. While the left-back is likely not to start it is relieving to see that Arsenal are finally getting their defenders back from injury. In terms of midfield, it would not be surprising to see experienced Czech Tomas Rosicky leap-frog Ramsey into a starting spot after he produced a solid performance last week against Blackburn. Rosicky looked a little more dangerous on attack than his Welsh team-mate and may reap the rewards after a good performance. With Gervinho still on international duty at the African Nations Cup, it is a no brainer who will start on the wings with Walcott set to start on the right and up and coming star Alex Oxlade-Chmaberlain set to start on the left after impressive performances in recent weeks. While Sunderland are suffering from a few injuries of their own, the Black Cats are not sitting in eighth position on the table for no reason and have come off a good string of wins in recent weeks. 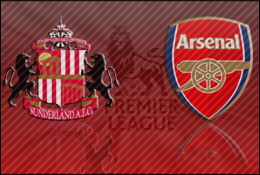 Away from home it looks to be a tough tie, but on paper he gunners should prevail and secure all three points! Everybody should be available for Saturday and we have no new injuries – that’s good news. So we can prepare well for the games this week. We have a very important week coming up with three different competitions, the Premier League, the Champions League and then the FA Cup. So it is good to have no new injuries. Both are in contention to be in the squad, there is no reason anymore to keep them out. But I will have to decide that tomorrow. Chamakh is now at normal fitness and Gibbs is getting closer as well. He is not far from full training, maybe two weeks. [He is running] normally. He had surgery on Thursday night unfortunately. He had what we have seen so many times; one cruciate [goes] and then the other as well. It was a case for Pires, for Edu and now Frimpong. I believe that it is unfortunate. The fortunate situation is that we could have surgery straight away and that this threat over his head is now gone. It’s a tough time because he was doing very well at Wolves. But hopefully we can get him back in the Autumn. Arsenal – Robin van Persie – The Dutchman has been in fine form in recent weeks, most recently with a hat-trick against Blackburn. Expect more of the same from Arsenal’s talisman and captain. Aston Villa – Stéphane Sessegnon – The Beninese footballer has been Sunderland’s main source of goals this term netting 6 goals and grabbing 7 assists this campaign. Paddypower are offering odds of 11/10 for the Gunners to win away. The best odds available are 12/5. Paddypower are offering odds of 5/2 for Sunderland to win at the Stadium of Light. allArsenal’s Special Bet: Anytime Goalscorer = Oxlade Chamberlain=13/5. ‘The Ox’ netted a brace last weekend against Blackburn, and has been in fine form since breaking into the starting lineup. He produces many stinging long range efforts and can finish tidily when inside the box.